A physical examination may reveal fluid behind the eardrum and poor movement of the eardrum. 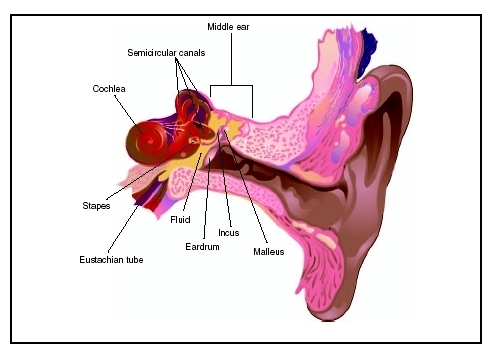 The eardrum may look clear and have no signs of redness, but may not move in response to air, as a normal eardrum would. A tympanometry test may reveal an impairment of eardrum mobility. A hearing test often shows some degree of hearing loss. Breastfeeding helps to pass along immunities to a child that may prevent otitis media. The position the child is in while breastfeeding is better than the usual bottle-feeding position for optimal eustachian tube function. If a child must be bottle-fed, it is best to hold the infant rather than allow him or her to lie down with the bottle. Because multiple upper respiratory infections may increase the risk for acute otitis media, reducing the exposure to large groups of children, particularly in daycare centers, may reduce the incidence. Children should also be kept away from environmental irritants such as secondhand tobacco smoke.